STIRLING, Ont. – Anne Finley still remembers when the song first began to take shape in her head. 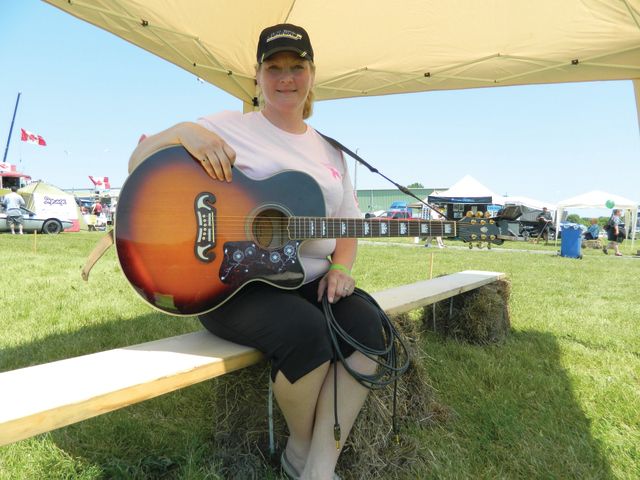 She was tarping a load last October just two weeks before her participation in the Ontario West version of the Convoy for a Cure when the lyrics came to her. She scrambled down off the trailer and grabbed her cell phone and quickly recorded the first few verses of what would go on to be Convoy for a Cure – the song. After securing her load and heading south towards Atlanta, Finley called Bill Petrie, bassist and producer for her band Anne Finley and Bar None. “I let him know I had this idea for a song and ‘I know it’s two weeks before the Convoy, but do you think we can pull it together?’ He was like ‘Hell, yeah – absolutely’,” Finley recalled in an interview with Truck News shortly before performing the song at the Stirling Truck Show June 18. Finley and Petrie hit the studio when she returned to Canada and she played an early version of the recording over the CB radio at the 2010 Ontario West version of Convoy for a Cure. The song was a hit, prompting Finley to return to the studio. A more polished version was released June 28 on CDBaby.ca, with proceeds going to the Canadian Breast Cancer Foundation. From there, she hopes to sell 1,000 downloads which will qualify the song for distribution on iTunes. Ultimately, Finley says her goal is to reach 100,000 downloads at a dollar each, which after admin fees are paid to CDBaby.ca and iTunes, would raise about $71,000 for the Foundation. “Step one is to get 1,000 downloads on CDBaby and get the song on iTunes so we can make it go viral and raise money for the Foundation,” Finley said. So far, Convoy for a Cure has been performed at the Stirling Truck Show, a few private parties and at last year’s Convoy. Already, the song seems to have touched many. “I had women come up to me at the Convoy with tears in their eyes, saying ‘What you are saying in that song is exactly what we should be doing, we should be fighting and we have to figure out a way to solve this’,” Finley said. When she wrote Convoy for a Cure, Finley was a professional driver with Tandet Dedicated and an Ontario Trucking Association Road Knight. After her Road Knight term ended, Finley hung up the keys so she could spend more time at home with her family. She’s now a recruiter with Sunbury Transport when she’s not gracing the stage as the lead singer for Anne Finley and the Bar None. For more information, visit her Web site at www.annefinley.com. To purchase the latest version of Convoy for a Cure, visit www.CDBaby.ca.